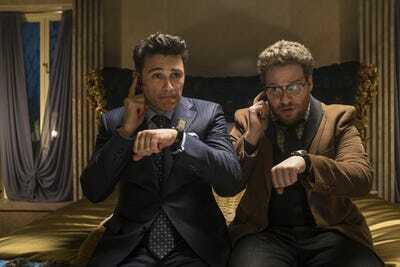 Ed Araquel/Sony Pictures EntertainmentJames Franco & Seth Rogen team up again, this time for the good of our nation. Seth Rogen and Evan Goldberg’s Kim Jong-un assassination comedy “The Interview” has been the subject of a lot of controversy. The film was originally scheduled to be released in October, but after North Korea declared the film an “act of war” and threatened a “resolute and merciless” response if the US government failed to stop the film’s release, it was delayed until Christmas Day. After viewing the relentlessly crass and silly finished product, I find it hard to take North Korea’s assertions seriously. The film is clearly a comedy far more than it is a statement on foreign policy. While Rogen weaves in plenty of details that don’t portray North Korea in very positive light, the movie never feels like an attack on the hermit kingdom. James Franco plays Dave Skylark, the host of “Skylark Tonight,” a tabloid news program that falls more in line with TMZ than CNN. Aaron Rapaport (Rogen) is the show’s producer, and after 1,000 episodes of asinine celebrity coverage, he wishes to be taken seriously. When Skylark finds out Kim Jong-un, the supreme leader of North Korea, is a fan of his program, he sets up an exclusive interview with the dictator in North Korea. When the CIA gets wind of this, they bring Skylark and Rapaport in and ask them to assassinate him. As all good comedies should, ‘The Interview” has heart, and the on-screen chemistry between Franco and Rogen keeps everything afloat. The script features plenty of Rogen’s trademark witty, crass humour and, just like in “Pineapple Express,” the off-the-cuff banter between the two leads never gets old. Lizzy Caplan is also great (but underused) as the CIA agent who “honeypots” the duo into the assassination. “The Interview” is full of pop culture references, Hollywood in-jokes, and hysterically funny cameos. Besides the barrage of unexpected celebrities, one of the film’s biggest laughs comes from Franco’s rendition of a pop song that rivals his Britney Spears piano number from “Spring Breakers.” While it’s not as inherently self-referential as “This Is The End” since Rogen and Franco aren’t playing themselves, there is similar humour at times, as Rogen shows that he isn’t afraid to make fun of anyone. The film is poised to be another surefire hit for Rogen, whose last two starring vehicles (“Neighbours,” “This Is The End”) were modestly budgeted at $US18 million and $US32 million respectively and each managed to gross over $US100 million domestically. The reported budget for “The Interview” is around $US30 million, so factoring in Rogen’s track record, the film should have no trouble raking in some serious cash when it opens this Christmas.